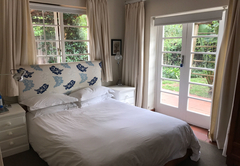 Waterfall Cottages is a 4 star graded B&B with self catering option, offering Craighall accommodation for tourists and visitors of Johannesburg. 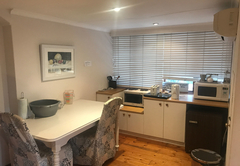 Welcome to Waterfall Cottages “Your Home away from Home” in Craighall, Sandton, where your hosts will strive to make your stay as relaxing and enjoyable as possible. 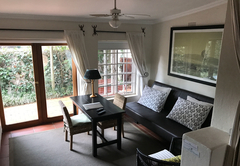 Set in a large, peaceful garden, these comfortable spacious, open plan cottages are set apart from the main house with their own entrances. All the cottages have undercover parking inside the property, which is fully secured by electric gates, and electric fencing. All the units are fully stocked with cereals, rusks and chocolate chip cookies and coffee and tea. 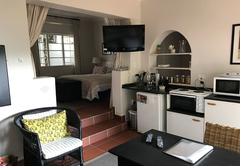 The “two-bedroom family cottage” consists of a main bedroom with a queen size bed with an en-suite bathroom. The 2nd bedroom has a bunk bed / twin beds. There is a 2nd bathroom with shower. The two “one-bedroom cottages” consist of a spacious bedroom with a king size bed or twin beds. 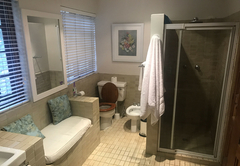 There is an en-suite bathroom with bath and shower, a fully equipped kitchen (so you can be totally self catered) and a lounge with a sleeper couch. 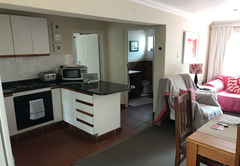 One double bedroom with bathroom en-suite. Open plan sitting room and small kitchen area. 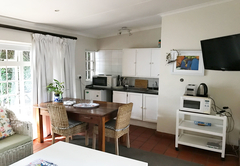 The cottages are self-contained, with fully equipped kitchens. All the cottages have their own telephone line. There is a TV with M-Net. Each cottage has a private patios. Ideal for long or short stays. 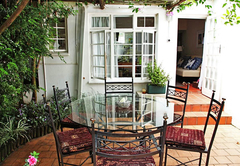 Close to Hyde Park, Rosebank, Randburg and Sandton. Fax, Internet and laundry facilities available. Undercover parking inside the property, which is fully secured by electric gates, and electric fencing. Continental breakfast is supplied to your cottage and placed in your fridge so you may eat at your own convenience. Spacious unit with king size bed or twin beds and sleeper couch. 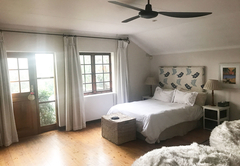 Waterfall Cottages was a last minute booking for us as our original booked accommodation cancelled due to unforeseen circumstances....it was a jewel of a find. 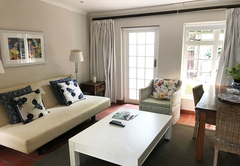 From arriving at the property we were well impressed with the beautiful landscaped gardens, play area for the children and spacious parking to the wonderful 2 bedroom and 1 bedroom cottages. We were greeted fondly by Bond, one of the hosts two family dogs. Having traveled for over 12 hours we were delighted at the comfort of the cottage as it had everything we required. Wakening to the sound of bird life was very special. The location was central allowing us to get to places relatively quickly. Very accommodating and friendly staff. Loved the visit. The venue is lovely and well kept.